I saw a picture of this quiche on Pinterest from another food blogger, and knew that I just HAD to make it. It is originally adapted by Martha Stewart, but in my opinion, her recipe is a bit bland (sorry Martha) as it only contains goat cheese and scallions as the flavor points. The other recipe, which added the fontina and arugula, seemed like it would be much tastier. I adjusted it slightly, added a few additional ingredients that suited my fancy, and wow… it is insanely delicious! Place arugula in a microwave safe container and sprinkle lightly with water (just a little sprinkle with your hand). Cover with plastic wrap and cook on high for 1 minute. Remove from microwave and allow to cool. Brush 9-by-2 1/2-inch springform pan with butter. Line the sides of the pan with strips of parchment paper (the same height as pan); brush paper with butter (this part is essential, as it will give you the lovely golden crust and keep the crust from sticking to your pan). Squeeze excess moisture from hash browns using paper towels. Remove hash browns from paper towels and place in a bowl with butter, 1 egg, 1 teaspoon sea salt, and 1/4 teaspoon pepper. Pat into bottom and up sides of prepared pan, using your hands. Place on a rimmed baking sheet and bake until set, 15 to 20 minutes. Take cooled arugula and remove excess moisture/liquid using paper towels and squeezing. In a large bowl, whisk 7 remaining eggs, sour cream, half and half, Fontina cheese, arugula, sun-dried tomatoes, onions, sausage, ½ teaspoon sea salt and 1/4 teaspoon pepper until well combined. Pour into crust, and sprinkle with crumbled goat cheese, incorporating some into the mixture. Bake until set, 45 to 50 minutes. Remove outer ring of springform pan, and gently peel off parchment paper. Note: This is a great recipe to tailor to your personal preference. Feel free to substitute your favorite cheese, leave out the sausage, or use bacon, and/or add some of your go-to spices. 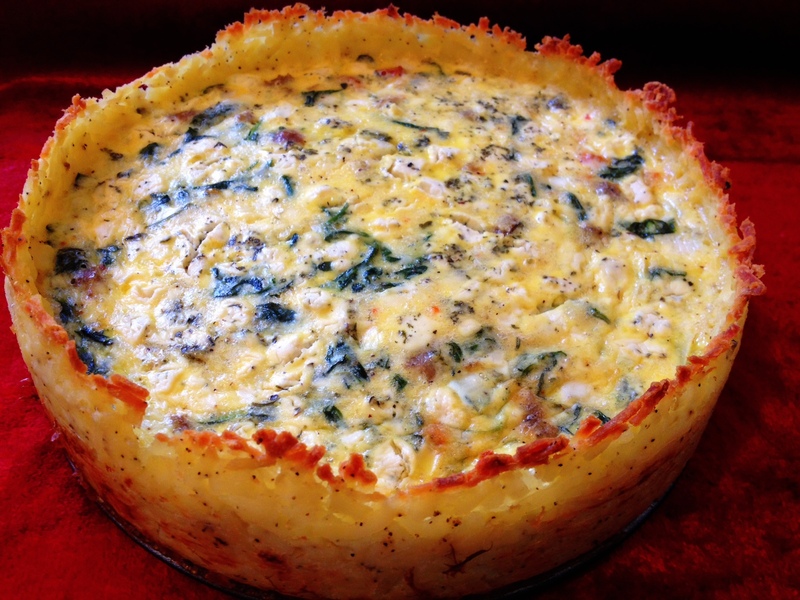 This entry was posted in Breakfast, Main Courses / Dinner, Recipes and tagged breakfast, brunch, dinner, fontina, goat cheese, hash browns, quiche, sundried tomatoes. Bookmark the permalink. 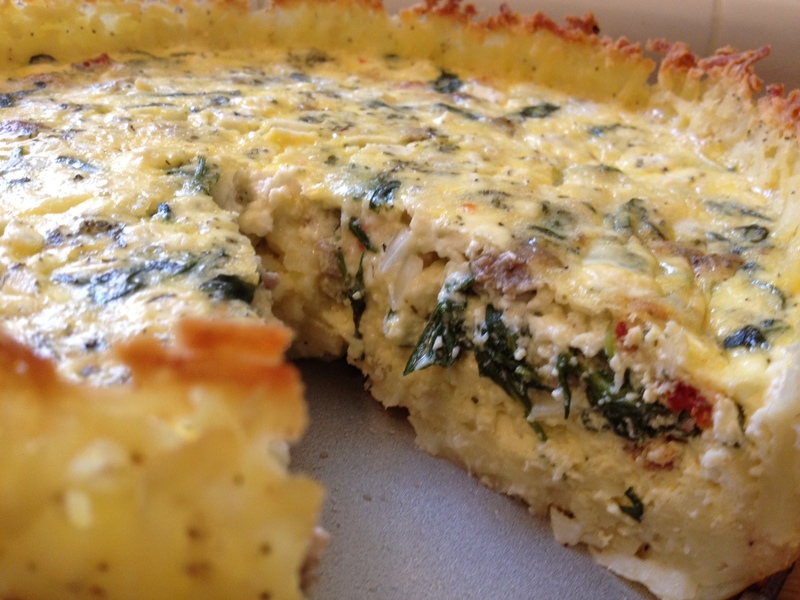 I used to make a quiche in a potato crust that I had totally forgotten about! It adds a flavor I love without, you know, a stick of butter!